Following last week’s ‘indicative votes’ to determine what sort of Brexit Parliament is for (as opposed to what it is against), yesterday’s ‘indicative votes – the sequel’ yielded four more againsts: Motion (C) Customs union got 273 with 276 against; Motion (D) Common Market 2.0 got 261 with 282 against; Motion (E) Public vote got 280 with 292 against; Motion (G) Revoke Article 50 got 191 with 292 against. On a point of order, Mr Speaker. You know me not to be one to play games in this place. With respect, may I ask you to reconsider when it comes to motions (A) and (B)? The reason why I ask—we live in unusual times, so I do not apologise for making this request—is that motion (A) is new, in the sense that it reflects the withdrawal agreement as amended by the backstop. I suggest to you that it is the one vote we have had in this place, on the back of the Brady amendment, that actually achieved a majority. It is a new motion that has previously achieved a majority, and with respect—and I mean that—I think it worthy for consideration. May I also suggest, if only for future reference, that motion (B) is actually the legal default position from our triggering article 50? I do think it is incumbent on us to consider that in this particular debate, when we are trying to find some sort of consensus. I am extremely grateful to the hon. Gentleman for his point of order and for the very reasonable tones in which, as usual, he expresses it. He and I have known each other for a long time, and I have the highest regard for the integrity of the hon. Gentleman. I am happy, although not obliged, to provide an answer to each of his two points. I say I am not obliged not in my interests, but because the House has long understood and asserted the obligation of the Chair to make these judgments and expected that the Chair would not provide an explanation, but that the House—having vested in the Chair the responsibility—would accept the judgment. However, I am happy in this case to respond to his two points. First, in relation to the hon. Gentleman’s motion appertaining to the backstop, he makes his own point in his own way. I have to make a judgment about what I think is reasonable going forward. In this debate, colleagues, we are not acting alone; we are acting in a negotiation with the European Union. The point that the hon. Gentleman feels strongly about is expressed in this motion for the first time, but it has been aired repeatedly—I do not say that critically, but as a matter of fact—since the publication in November of the withdrawal agreement. Repeated commitments have been made to seek a re-examination of that point by the Union, and it has become clear over a period of months that that re-examination is not offered by the Union. It may or may not feature in the future, but in terms of trying to broker progress now I did not think it would be the most sensible motion to choose at this time. I put it no more strongly than that. Secondly, in relation to the so-called no-deal motion, if the hon. Gentleman will forgive me—and, frankly, even if he will not—I am going to replay to him his own point in my support rather than his. Somewhat exasperated—well, quizzical—that I had not selected his motion, he said, “But Mr Speaker, leaving without a deal on 12 April is the legal default.” He is right: it is precisely because it is the default position in law that having it on the Order Paper is, in my view, a rhetorical assertion. It is a statement of fact, and it does not in my judgment require debate. The second point on that motion is that in looking at it—[Interruption.] The hon. Member for Torbay (Kevin Foster) can chunter from a sedentary position in evident disapproval of the thrust of the argument that I am developing if he so wishes, but it does not detract from the fact that I am making the point I am making. He does not like it: I do, and we will have to leave it there. The simple fact of the matter is that that motion, voted on last week, as the beady eye of the hon. Member for Basildon and Billericay (Mr Baron) testifies he realises, was rejected by 400 votes to 160. A significant number of Members did not vote, but even if every Member who did not vote on that motion last week were to vote in favour of it this week, it still would not pass. I see my duty as being to try to advance matters. Whatever people think about this issue and whatever side of the argument they sit, they all think, “Can we not make some progress?” It is in pursuit of progress that I have made the disinterested—I use that old-fashioned but valid term—judgment that I have made to try to serve the House. I totally understand that it will not please everyone, but it happens to be my view, it is an honest one, and it is my best judgment. For the first time in 1,000 days since the referendum, the European Union blinked. For the first time there was a sign of disunity and then they gave a concession to Britain which they were not intending to give earlier in the day. This came about, it seems, because suddenly they took seriously the possibility of Britain exiting with no deal – a rumour that the Ministry of Defence was preparing for a no deal. It just makes you wonder whether over the last 1,000 days if at any time the Government had prepared for not deal, if at any time the Government had made the European Union take no deal seriously, if Parliament hadn’t consistently undermined the option of no deal, what we might have achieved. But the Speaker isn’t permitting this to be tested further. A majority of MPs has expressed a clear parliamentary will for the ‘Brady Amendment’ (reiterated here by John Baron), but the Speaker won’t allow it because it transgresses the EU’s immutable precepts and infallible dogma. It doesn’t matter what the people want. It doesn’t matter what our elected representatives want. The only thing that matters is what the EU will permit, and thereby ‘progress’ may be made. And that ‘progress’ is teleologically determined: to remain tied to and bound by the treaties of the European Union. 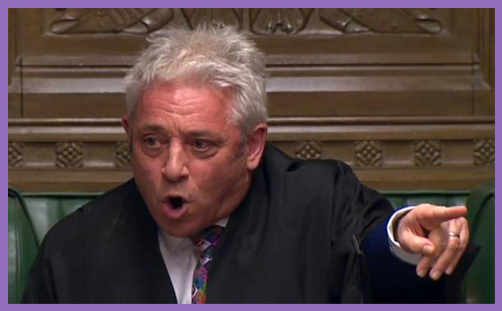 Even though a sovereign Parliament determined that the sovereign people should decide the matter of that relationship, and that sovereign people voted by a majority to leave the EU, Speaker Bercow prostrates himself before the suzerain power. So Parliament may express its will only to the extent that that will inclines toward Remain: all debatable options lead to the Treaty of Rome. There is no accommodation of those who wish to rid themselves of its protocols; no respect for those who wish to be free of its constraints. There is no toleration of that with which the EU disagrees, and the only acceptable agreeing to disagree is that which agrees with its fundamental dogmatism, which is absolute. This isn’t democracy: it is a totalitarian coercion into a contract which violates liberty. The people voted to leave the EU: they did not vote to make themselves slaves by sacrificing all their future liberty. If the Speaker – the First Commoner of the Land – cannot or will not cease the moralism or paternalism which inclines him to regulate debatable options or prohibit parliamentary procedures which are antithetical to the EU because they offend against the EU, then the commoners need a different champion of their sovereignty to chair their proceedings – one who will do so without prejudice or partiality.